Looking for a project with bold color? I’ve long been inspired by Mexican blankets with their bold color and geometric prints, and finally I found a chance to incorporate this beauty into a project with my Southwestern Cinch Cowl. 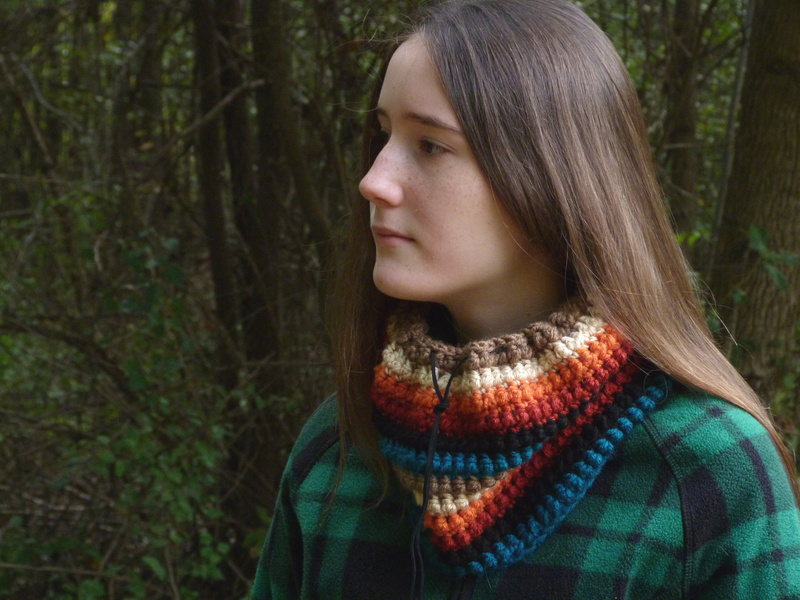 Worked with 6 different medium weight yarns, this cowl is also an excellent stash buster. It is crocheted with alternating rows of single crochet and single crochet puff stitch, an easy and fun transition with a gentle twist of texture. It only takes a few hours to make so go ahead and grab some colors from your yarn stash and give it a try! Single Crochet Puff Stitch (puff): yarn over, insert hook into indicated stitch, yarn over, pull up a loop, yarn over, pull through all 3 loops on the hook. And then repeat once, working Round 25 in taupe as well. Cut about 2 yards of black suede cord. Fold cowl in half by starting at seam to find the front. With yarn needle, weave cord through round 24, every two stitches apart. Start at back seam and stop at the front half, then thread other end of cord and weave through other side. Tip: if your suede cord is a bit kinked from packaging, use an iron to smooth it out. But be careful not to stretch the cord! If you have any questions or need any help, just leave me a comment below and I’ll see what I can do! This entry was posted on Monday, October 22nd, 2018 at 11:11 AM by Amy	and is filed under Free Crochet Patterns. You can follow any responses to this entry through the RSS 2.0 feed. You can skip to the end and leave a response. Pinging is currently not allowed.